After some consideration I decided to use embroidery as my medium for this challenge. I did some eco rust dying on my art retreat in the US in the summer and I though this pieces was evocative of sandstone rocks and would therefore make a good backdrop. I looked around for images to inspire my design and found a few that I liked but in the end I only had time to complete one. 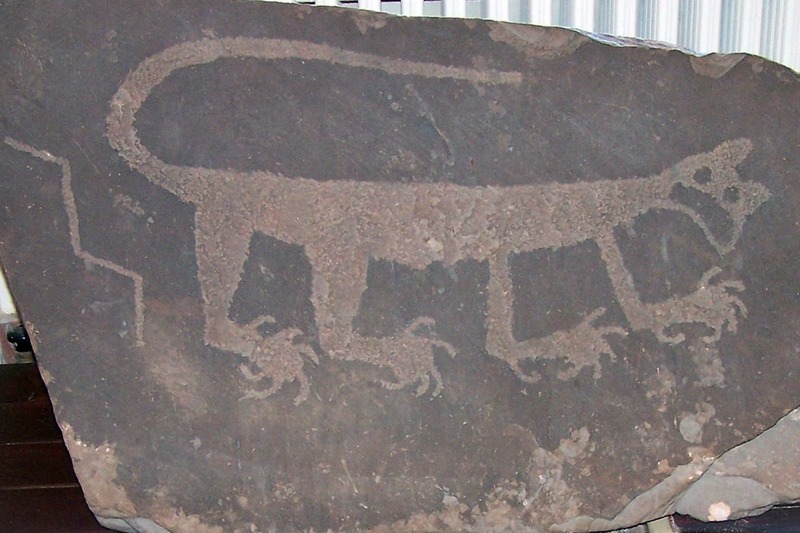 I chose this example from the Petrified Forest in Arizona, USA – a petrified puss thought to represent a mountain lion. Since the style is so naive I wanted to keep the stitching very simple so opted for using chain stitch throughout, first creating the outline and then infilling. 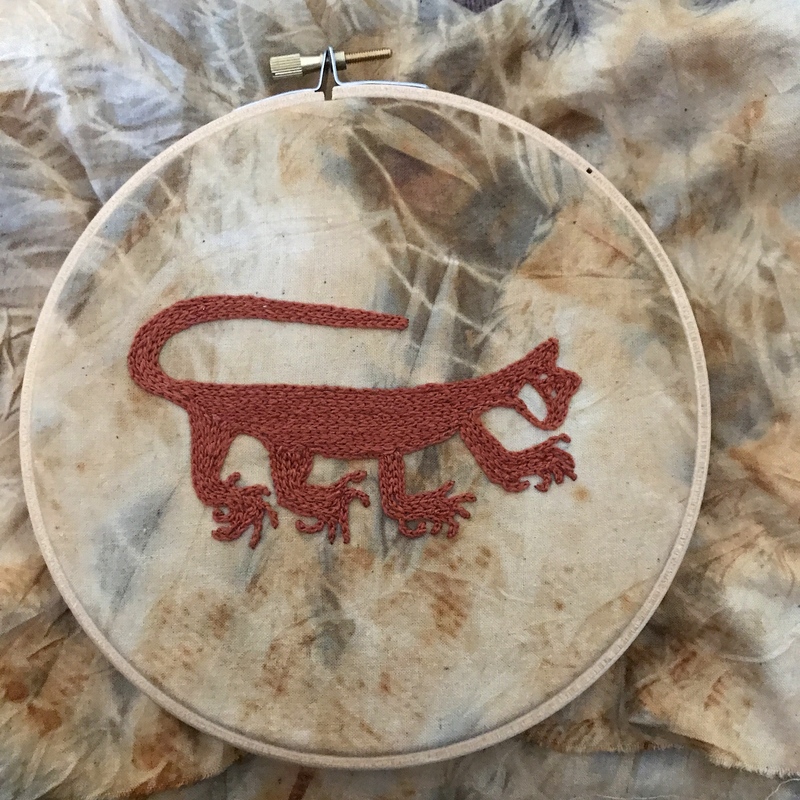 I didn’t have a clear idea of what I would do with the piece when I started and I’m still not sure…I could simple make it a simple hoop frames piece or, I could continue stitching more designs on the fabric to make a bigger wall hanging. I think I’m just going to have to ponder that for a while. I did manage to create a necklace for this challenge based on the ancient hillside chalk figure of the Uffington White Horse in Wiltshire – not too far from where I live. I’m not sure if this strictly fulfils the definition of a petroglyph being carved into a hillside and fill with chalk but it’s close enough for me. Besides which, I used a fabulous carved cabochon by Jenny Davies-Reazor which is in itself a kind of modern day example of the medium. The horse is thought to possibly date from the late Bronze age so I restricted my palette to shades of green and bronze and created a beaded setting for the cab. A bronze spiral (also a pattern prolific in petrogyphs) charm by Staci-Louise Smith adds a lovely finishing touch. So that’s where this months inspiration took me and many thanks to Karen for coming up with such a great theme. To see what the rest of the Art Elements team and out guest designers have come up with simply click on the links below to join the blog hop. oooo I love the petrified puss and you are the second person in this challenge to use that image with both being so different! Jenny’s pieces never fail to inspire and that necklace is just beautiful. I adore where you went with this one. I’ve been itching to some embroidery lately, but my nieces have taken off with all my embroidery thread to make friendship bracelets. HA! I’m hoping to get my boxes back this week. In the meantime, I’ll just have to gather inspiration like this mountain lion of yours. I really love that you used the eco-dyed fabric. I have some of my own that I made in the spring on a retreat too. Hmmmm…. I’m sure you’ll find some way to use the kitty later! As for the necklace, how serendipitous that you had both of those pieces in your stash that work so well for this challenge. You combined them beautifully! That’s amazing and cool and beautiful – and I’m not saying that because I don’t know any better words. 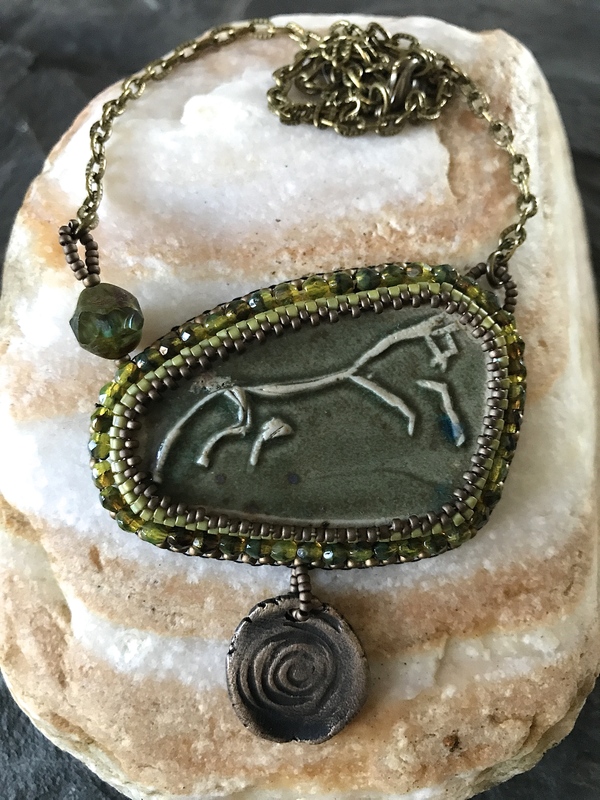 I love both the kitty (I’m sure you find a gret way how to use it) and the horse which is so perfectly complimented by the beaded bezel’s colors and the spiral component! Wow, the embroidery is amazing! Even better is your dyed cloth, it’s absolutely beautiful! Your beadwork on your pendant is perfection,! Love them both. Love the petrifed puss, I have a thing for rust dyed fabric, and your necklace is beautiful, I love the colour palette you chose. Your dyed fabric is amazing… another thing I need to try out 🙂 Love the puss, his toes are fantastic, and your necklace design is the perfect setting for Jenny’s cab! We were thinking alike this time around. 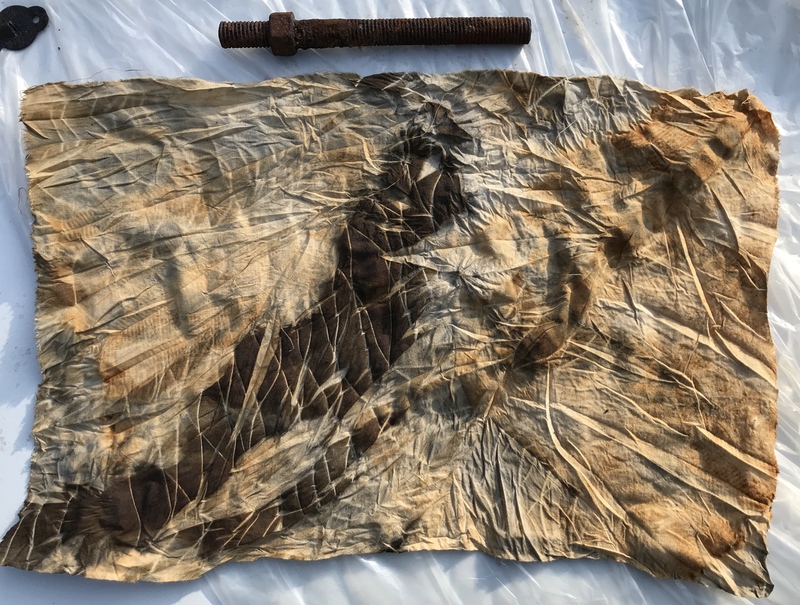 I think the rust dyed fabric was just begging to be a background for petroglyphs. You chain stitching is superb for this piece & I really love the toes! The necklace is also fantastic. I just love that horse cabochon. And I really like the way you did the asymmetrical attachment for the necklace. Lovely!! I love that you were able to use that lovely fabric and add to its beauty with your cat petroglyphs. You created a special piece to be displayed. The horse cabochon is just beautiful. Your necklace does it justice. I so love your stitched cat on the wonderful fabric! Both ideas, a single frame or a bigger wall hanging, sound good! Your horse necklace is wonderful and I love the colours and shapes you used. The dyed cloth is gorgeous and definitely evokes sandstone. The way you chose to stitch the cat is perfect for the theme. The necklace is stunning and I especially love the asymmetry. 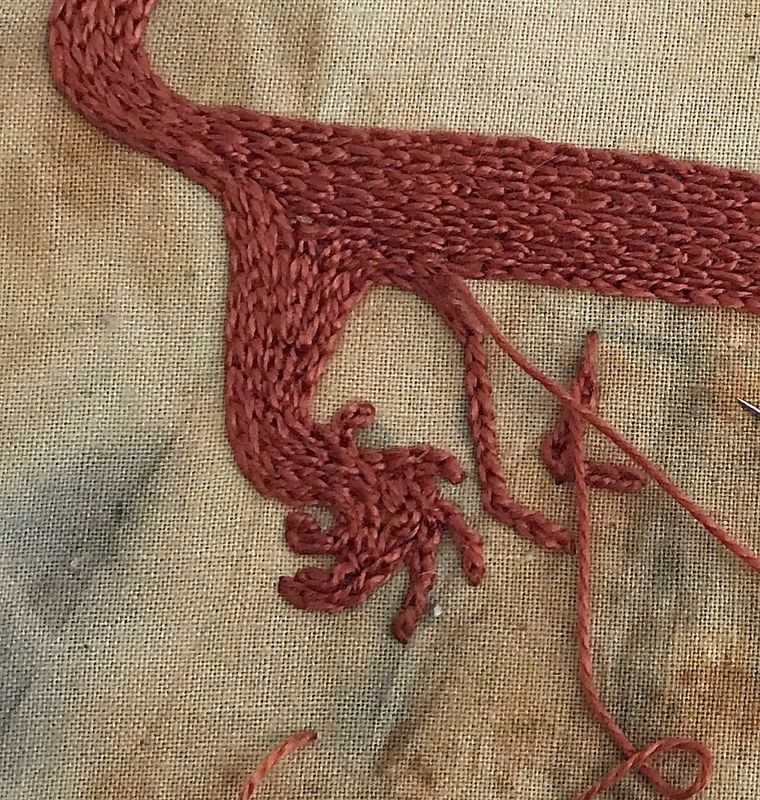 Chain stitch was a really cool looking textural fill! I do love the rust printed fabric for this challenge. Ideal! Thanks for making my wee stoneware Uffington horse a star. I love the bead to balance out the asymmetrical cab! Lesley I absolutely love these two designs. My fav is the mountain lion stitched onto the primitive looking cloth. Really evokes the naive ancient feeling of the original glyph. Petrified Puss .. gotta love that :)). Great pick! And the rusty dyed cloth is perfect. As are your chain stitches, very well done. I do like the necklace too with the seed beading. You had a very productive month. 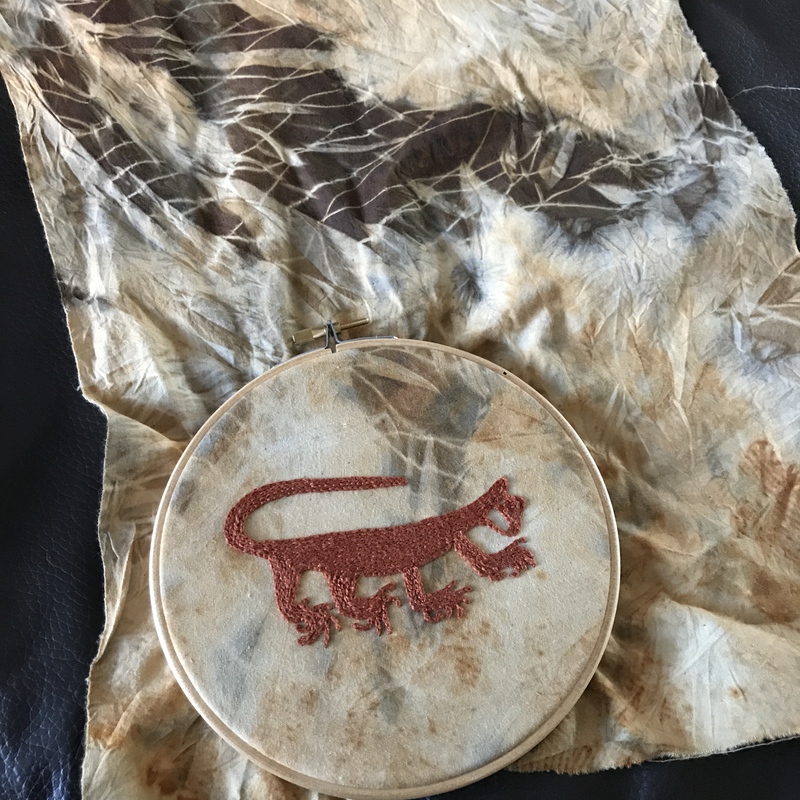 I love seeing what you did with the rust dyed cloth, what a great interpretation of the lion. Also love the necklace – fantastic as always! Sorry to be hopping so darn late… Your stitched kitty is looking very cool. I look forward to seeing what you end up doing with him. That necklace is just perfect for the challenge! Great art beads you found in your stash!